HDTV Supplys High Speed 24 gauge 1 foot HDMI cable with HDMI 2.0b and HDCP 2.2 compliancy connects 4K Ultra HD source devices to 4K UHD displays and projects. The CL2 rated WolfPack 1 Foot HDMI Cable jacket is designed to meet the requirements for in-wall installations. The Ethernet capabilities of the 1 Foot HDMI Cable allow a user to connect multiple Ethernet enabled HDMI devices through a single Ethernet connection. NOTE: All 1 Foot HDMI Cables are not made the same and the smaller the diameter (or gauge) of the 19-internal wires an HDMI cable has the more resistance, in ohms, that cable has that can impact the picture quality, especially a 4K signal. 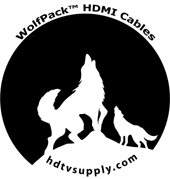 HDTV Supply manufactures this WolfPack 1 Foot HDMI Cable using large 24 gauge (AWG) wires assuring you better video and audio vs smaller diameter 26, 28 and 30 gauge HDMI cables. Always buy a 24 AWG (Gauge) HDMI cable if you want the best picture now and in the future. The WolfPack™ 1 foot HDMI 2.0b cable supports 4K @ 50/60 Hz which is 4 times the clarity of 1080p/60 video resolutions and up to 32 audio channels for a surround sound audio as well as simultaneous delivery of dual video streams to multiple users on the same screen, if your devices support it. If your existing cable is not high speed, though, you will need this cable as it supports up to 4Kx2K resolutions up to a stunning 60 Hz and above frame rate. HDMI transmission is very complex and while there may be little advantage to better cables at short lengths, the need for better cable construction goes up exponentially as length of run, signal bandwidth requirements, and number I/Os goes up. This 1 Foot HDMI Cable 24 gauge high bandwidth cable is tested to perform at industry standards and is backed by a lifetime warranty. Why not buy this WolfPack 1 Foot HDMI Cable today? HDTV Supplys 24 gauge 1 Foot HDMI Cable supports Dolby Atmos which is a new audio format for creating and playing back multi channel movie soundtracks. It was developed to give movie sound a more three-dimensional effect. Traditional 5.1 and 7.1 channel surround setups deliver captivating sound using speakers placed all around your room and only our HDMI cable supports it. Q: Do you need new HDMI cables for HDR? A: Upgrading to a new HDR TV? Think you might need new HDMI cables for it to work? You may. Here's the deal. The latest TV technology is high dynamic range, or HDR. If you want to take advantage of this latest and greatest, you need an HDR TV (of course), an HDR-capable source (either a streaming app on your TV or a media streamer/UHD BD player) and HDR video to watch. But do you need new HDMI cables? Surely those many-years-old, dust-covered, ultracheap cables you bought at Dollar World can't handle this new TV technology? 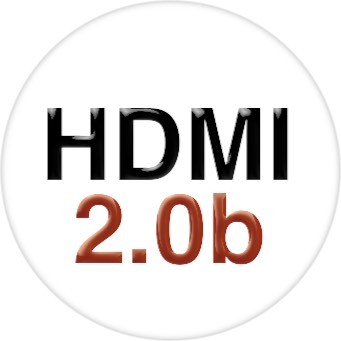 What you DO need is HDMI 2.0 and in every step in your AV chain (the expensive devices into which you plug the cables) generally must be HDMI 2.0a for HDR to work. 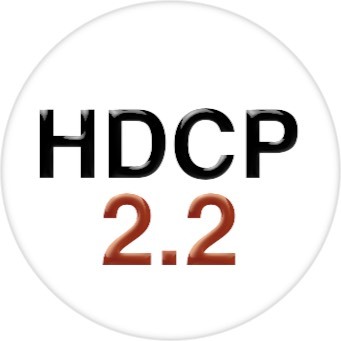 As in, your TV, receiver and source all have to be HDMI 2.0a, and usually require HDCP 2.2 copy protection too. If your TV is HDR, it almost certainly has at least one HDMI input with 2.0a/2.2. If your receiver/sound bar is a few years old, it almost certainly does not. If you're not getting 4K HDR, check all your settings. That's the most likely culprit. That said, it's possible for the cable to work fine with 1080p, and not give you a signal with 4K (giving you a black or flickering screen). 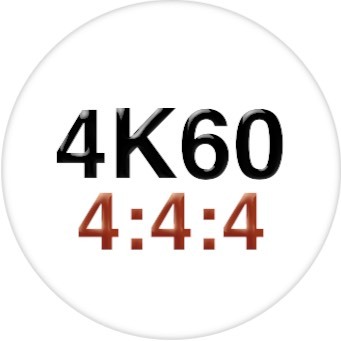 It's possible for you to set 4K on all your gear, have it try to work and then default back to 1080p. If you've double-checked all your settings and it's still not working, or you get an image but it cuts out, then you might need a new cable. You don't, however, need to spend huge amounts of money as just get this HDR-Ready 24-gauge HDMI 2.0b and HDCP 2.2 HDMI cable here at HDTV Supply. HDTV Supplys 1 Foot HDMI Cable is designed and built to the higher standards for your home theater or business use. To demonstrate that HDTV Supply products offers world-class quality HDTV Supply offers the original purchaser a full lifetime hardware warranty on this HDTV Supply product. This means that as long as a customer owns this 1 Foot HDMI Cable and can show original proof of purchase, HDTV Supply, or its supplier, will replace it if it malfunctions. A 30-day RETURN also comes with this warranty as well as Free Lifetime Tech Support. In order to get a warranty replacement for a defective 1 Foot HDMI Cable, HDTV Supplys Support Team will verify the product is eligible for warranty. An RMA number will then be issued. Shipped replacements will be in like new conditions, tested and all components included. Why not buy this WolfPack™ 1 Foot HDMI Cable today?